Becky Kay wins the Women's Classic at Cottesloe Golf Club. 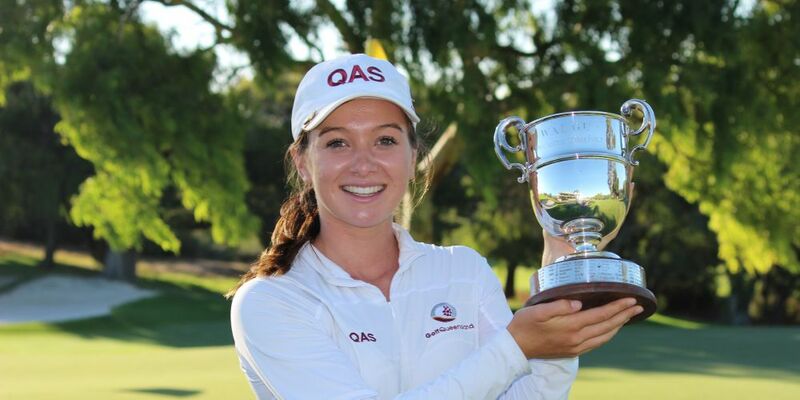 BECKY Kay clinched back-to-back Women’s Classic titles at Cottesloe Golf Club last Wednesday after a blistering final round 67 gifted the Queenslander her third straight national rankings event. The emerging star was all class on the final day, turning at the ninth hole to be seven strokes ahead of nearest competitor Stephanie Bunque, before rounding off the victory with -2 on the back nine. Kay (19) finished seven shots ahead of Bunque in her wire-to-wire victory, with Doey Choi and Kirsten Rudgeley finishing a further three shots back. The win means Kay reaches the summit of the Karrie Webb Series, overtaking Grace Kim in the official standings and rounds out a trio of tournament wins, with Riversdale Cup and Rene Erichsen Salver also in her 2018 trophy cabinet. Victorian Bunque became only the second women during the week to shoot under par with four straight birdies on the back nine lifting the youngster to second place. A final round 72 to Kathryn Norris meant three West Australian competitors were in the top six overall, with Maddison Hinson-Tolchard also enjoying the Cottesloe outlay. Janine Northrop earned a six-stroke victory in the 54-hole seniors event, ending with a final round 84. Lisa Taylor was the winner of the Mid-Amateur event with a round of 88 enough to see her gain the crown.